AWESOME LAUNCH > REGISTER NOW for the NEW Onni RIVA Richmond Olympic Village Condo Project > One of the TOP DEVELOPERS and an ENVIABLE LOCATION! NEW DRAFT FLOOR PLANS ARE OUT > Scroll to bottom of this page! MODERN RICHMOND RIVERSIDE LIVING > Coming soon to the Oval Village Richmond real estate district are affordable condos by Onni starting from just $285,900. From one of the most highly rated developers on VRED, Onni is at it again, developing a truly well located and affordable Richmond condo project. The Oval Village Richmond Riva Condos feature 4 spectacular low-rise buildings of 6 floors (wood framed buildings) located between River Road and Alderbridge Way Richmond, just seconds away from the water. There will be a combination of 1 to 3 bedroom condo suites for sale in addition to boutique Richmond Riva Town Homes (multi-level residences). The architecture is truly west coast modern and features cascading butterfly roofing and an orientation that maximizes both views and exposure to natural light. Inside, the modern Oval Village Richmond Riva condos for sale will feature contemporary balanced living spaces with high-end finishes, well thought out features and spacious layouts. 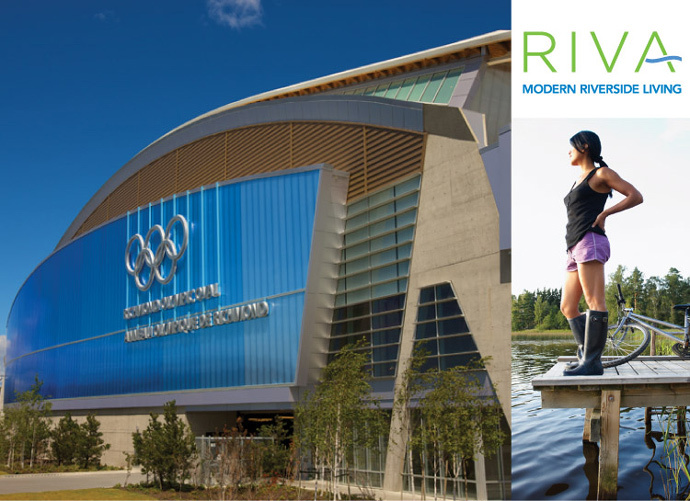 Riva Richmond condos provide modern riverside living in one of the fastest growing communities in the Lower Mainland: The Oval Village Richmond neighbourhood where you will discover all urban amenities, the Olympic Oval facilities, water and parks nearby. In addition, for families with children, some of the top ranked schools and educational facilities are within minutes of the new Oval Village Richmond Riva Condos by the Onni Group Developers. The grand opening presales event is scheduled for mid Fall 2012. For more information, please register online or visit www.onni.com/riva/ for more details as they are posted. The Onni Group is a very well established and experienced builder and as mentioned above, one of our most favourite developers of boutique multi-family housing. The Onni Group Developers are well known for their customer service and attention to detail before and after your new Richmond Riva condo home is complete. Situated along the beautiful banks of the Fraser River, the new Riva Richmond Oval Village neighbourhood embodies the ideals of active, sustainable living. The countless natural and urban amenities at your finger tips, the preconstruction Richmond Riva Condos at the Oval Village will not only feature the Richmond Oval (Olympic Venue transformed into a health and wellness hub), but also a neighbouring park in the future, river side trails, T&T Supermarket, four major shopping malls and of course over 1,400 acres of parks and 40 kilometres of interconnected trails, cycling routes and walking trails. Richmond RIVA Condo Buyer Incentive Program! All homes include 1 parking stall! The total deposit required is 20% down (standard in this market) with 5% at the time of the initial offer, 5% due within 60 days of acceptance, 5% 7 days from BP and 5% at 180 days from BP. The low strata fees at the RIVA Richmond condos for sale are expected to start from $0.27 per square foot! The development is designed by Yamamoto Architects and features four 6 storey boutique mid-rise buildings. The first phase includes only 142 homes for sale. 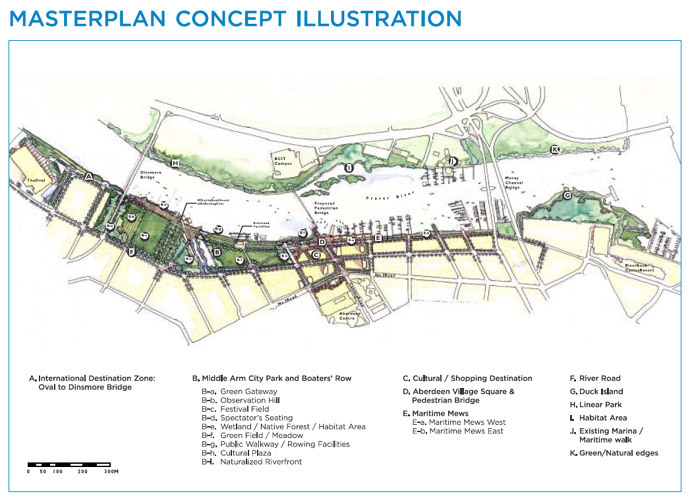 The location of the new RIVA Richmond Oval Village condos is right at 7731 Alderbridge Way Richmond BC. 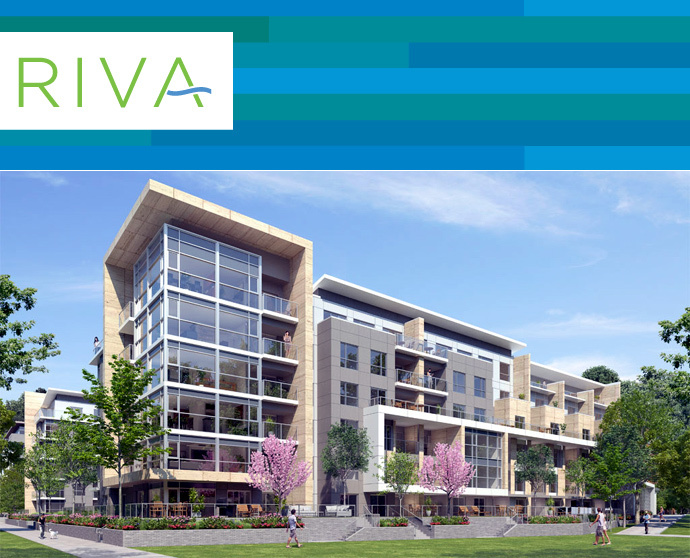 RIVA Richmond condos by Onni is located on the waterfront within the Oval Village Richmond real estate district where you will find countless urban and natural amenities surrounding you. Some of the key highlights includes a future park, beautiful riverside trails, a T&T Supermarket and four major shopping malls within minutes. In addition, there is over 1400 acres of natural parkland and over 40 kilometres of waterfront and interior trails within a few minutes of your new home at Richmond RIVA by Onni. In addition, the RIVA Richmond condo development will also include an exclusive amenity space called CLUB RIVA which features over 12,000 square feet of recreational facilities. In addition, within this space is a 2,000 square foot professionally designed fitness studio gym, an indoor swimming pool with a steam and sauna rooms in addition to additional rooms for games, social or business meetings. Outside, the CLUB RIVA at Richmond’s Oval Village will include an outdoor entertainment patio in addition to a great children’s play area. In addition, some of the other outdoor amenity spaces include large urban garden plots for growing your own veggies, peaceful tree lined greenway for strolling or biking through the waterfront community, BBQ areas for summer gatherings and safe and secure children’s play areas throughout the development. The modern riverside community has also hired Sherman Tai, Feng Shui master for design consultation. All homes will have the 2-5-10 year National Home Warranty! The Interior Finishes at Riva Richmond Apartments are Amazing! Our first glance at the finishes and design selection at the new Richmond Riva by Onni apartments is awesome! The general suite finishes will include two warm and modern colour schemes in addition to clear finished oak cabinetry with solid white countertops or smoke grey stained oak cabinetry with textured white cabinets. Also, there is Berber-style trackless stain resistant carpets in the bedrooms and oak hardwood floors in all main living areas. Large format tiling will grace the bathrooms and laundry closets which have Whirlpool high efficiency and full size front loading stacking washer and dryer. All homes at the preconstruction Richmond Riva condos by Onni will also have horizontal one inch white venetian blinds on all exterior windows. The ‘opulent’ bathrooms as they are called at the preconstruction Richmond Riva condos by Onni include Nuheat in floor heating in all primary bathrooms, double nose marble counters with six inch high backsplashes and flat panel wood cabinetry with rift cut oak veneer facae and coordinating brush metal hardware. Other bathroom features include sleek and simple undermounted sinks with modern faucets in addition to luxurious deep soaker tubs and glass enclosed porcelain tiled showers. The beautiful kitchens at the preconstruction Richmond Riva condos by Onni include six piece premium KitchenAid stainless steel appliance set (with Energy Star fridge/freezer, high efficiency Whisper Quiet Sound Insulated dishwasher, built in microwave with trim kit, slide out hood fan, gas cook top and Even-Heat True Convection System wall oven). In addition, the kitchens at the riverside Richmond Riva condos by Onni will have polished chrome faucet, extra deep stainless steel under mounted sink, cabinetry with modern hardware or touch latch, soft closing mechanisms, puck lighting, contemporary white gloss lacquer upper cabinetry and custom flat panel cut oak veneer bottom cabinetry with wood gables and island backs. Also, the counters will have composite stone. The master planned Onni Development at RIVA Richmond riverfront condos for sale is truly a ground level opportunity for first time homebuyers, investors, downsizers as well as upsizers in this market! Affordably priced and just steps from the beautiful riverfront, the new Onni RIVA Richmond condos for sale will be situated adjacent to the highly successful River Green ASPAC development (which is a lot more expensive!). Here, the RIVA Richmond riverfront condo project will be split into four phases, each one taking approximately one and a half years for construction completion. In addition, each of the 4 buildings at the Onni RIVA Richmond riverfront condos will be it’s own strata (that’s great news) and the completion for the first residential building is coming up for Fall 2014. The 6 storey advanced wood frame construction with concrete foundation is much higher end and advanced compared to other projects in the Lower Mainland and the preconstruction Richmond RIVA Phase 1 condo building will house about 140 to 150 residences. The strata fees at RIVA by Onni will be about $0.29 per square foot (subject to change at any time) and this is truly affordable as it includes gas, hot water, air conditioning, amenities and building maintenance. The major amenities at the Onni Richmond RIVA Oval Village condos will include a fitness area, steam room, hot tub and possibly a swimming pool too! Located on an Oval Village Richmond real estate site along the riverfront, Onni’s new project will be a ground level opportunity before both The Hungerford Group and Amazon build out their sites next door. Starting from an affordable $285,900 during presales, the new Oval Village Richmond RIVA condos will present 2 main colour palettes that are night and day. The Onni RIVA Richmond preconstruction condos will have heating and air conditioning (likely to be forced air vents, so there are no baseboards!). In addition, the ceiling heights are amazing, with most suites having 9 foot ceilings and the top penthouse units having 10 to 11 foot incredible ceiling heights! Great value starts with the kitchen appliance set by KitchenAid which includes a pull out fan, gas range and full size Whirlpool front loading washer and dryer. The outdoor living spaces at the preconstruction Richmond RIVA condos by Onni are expected to be some of the largest in the area, giving you lots of room to entertain or just relax. There will also be a significant number of spacious and functional floor plans for condo buyers to choose from upon the grand opening launch. Again, the presale Richmond price point starts from just $285,900, making them some of the most affordable units in the Oval Village neighbourhood. As well, the great deposit structure (if you decide to purchase) is five per cent upon contract writing, another five per cent 6 days later on rescission date, five per cent when the developer gets the building permit and 5% at 180 days. WHY Purchase a New Riva Richmond Condo as your Next Home or Investment? If you see the above chart, homebuyers will realize the affordability of the new Onni Riva condos in the Oval Village Richmond community. Starting price points are well below $300,000, which is affordable for modern riverside living. Riva is a collection of modern 1, 2 & 3 bedroom homes coming soon to the Oval Village – Richmond’s next great waterfront community! With presale Richmond Riva homes starting from $285,900, be sure to stay tuned to hear about the opening date sometime early November. There are also many other reasons to purchase a new home or investment at Riva Richmond condos including endless activities and recreational options along Richmond’s forty kilometres of beautiful waterfront trails and the Richmond Oval facilities. In addition, live just minutes away from the Lansdowne Canada Line SkyTrain Station for easy access to downtown Vancouver and the YVR Airport. Lots of shopping and dining are also within reach from your new Oval Village Richmond Riva condo home with Richmond Centre and Lansdowne Centre just seconds away in addition to a soon to open T&T Asian Supermarket. There will also be a future city park across the street from this development too! Yamamoto Architects has designed a truly unique and striking Richmond condo project at the new Oval Village Riva by Onni Group condominiums. With 4 spectacular wood framed buildings of 6 storeys each, Yamamoto Architects featured contemporary modern riverside design with beautiful cascading butterfly roof designs and orientation that maximizes views and natural light. The homes at the new Riva Richmond condos for sale will feature expansive outdoor spaces as well as over height ceilings, which makes all of the Yamamoto Architects designed residences feel airy and bright throughout the year. As well, the landscape architecture by Yamamoto Architects for Riva Richmond condos includes ponds and water features within beautifully landscaped courtyards for home owners and residents to enjoy, socialize and relax. The property will also include tree lined paths and lush green spaces in addition to entertainment areas, barbeque areas (which are great for the summer months) and a general village style atmosphere that is unheard of in this area. The preconstruction Richmond Riva Condos by the Onni Group are located between River Rd and Alderbridge Way Richmond. In addition to the popular condo suites for sale, there will also be a boutique collection of new Richmond Riva Town Homes for sale. The Riva Richmond condo community comprises 4 amazingly designed and constructed 6 storey wood frame buildings situated between River Road and Alderbridge Way in Richmond BC. Only moments from the riverside, homeowners can enjoy an enviable Richmond waterfront location which is also within walking distance to the famous Olympic Oval, major transit routes including the SkyTrain and the best dining and shopping options in the area. Inside the homes at the preconstruction Richmond Riva Condos at the Oval Village, home owners can enjoy features such as oak hardwood flooring, double-nose composite countertops, contemporary soft close cabinetry, and a premium 6-piece KitchenAid appliance package with a gas cook top. Expansive outdoor spaces in most homes at Riva Richmond condos is standard, as well as over-height ceilings, allow for maximum opportunity to enjoy views. 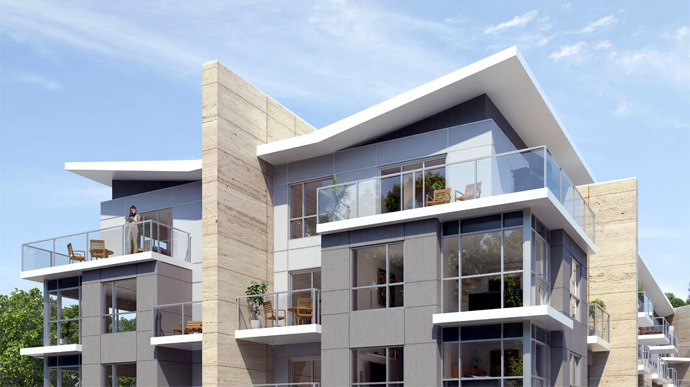 The new Onni Riva Condos will present modern riverside living to prospective home buyers. The master plan has four buildings boasting true West Coast modern architecture and situated just steps from Richmond’s world class Oval Village neighbourhood. The Riva Richmond riverside condos will be launching Fall 2012 with a starting price point from just $285,900. This is a ground level opportunity to own in the Oval Village Richmond real estate market which is only just coming of age and becoming the sought after established neighbourhood that will attract home buyers and investors of all lifestyles and ages. 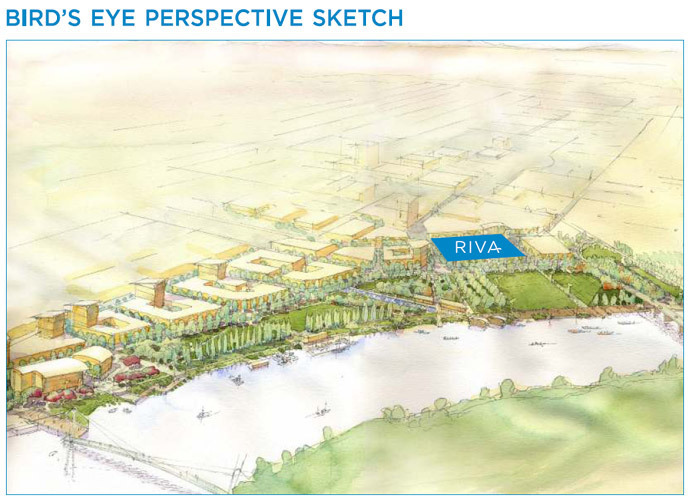 Riva Modern Riverside Living > Onni’s newest addition to the Richmond Oval Village is coming Fall 2012! Called the Richmond Riva Condos, this new Onni Group development represents one of the best Richmond waterfront real estate values and the most affordable riverside living in the Lower Mainland. There will be a future city park just across the street from the Richmond Oval Village Riva Condos by the Onni Group and the 6 storey wood framed buildings (total of 4 residential buildings) will be located within a natural urban community just minutes away from numerous green spaces, a quiet neighbourhood, services, SkyTrain Station, T&T Supermarket, world class shopping and dining, big box retailers and the Richmond Dyke area. In addition, Riva Richmond condos for sale are situated just minutes from the Vancouver International Airport and 25 minutes to downtown Vancouver. It is only a half hour drive to the US Border as well. The unique and contemporary West Coast architecture at the Riva Richmond Oval Village condo project is designed by award winning Yamamoto Architects and the design takes its cues from the neighbouring sites and sounds of the river. The cascading ‘butterfly roofs’ as well as the HardiePanel and stone make for a very unique façade unlike any other cookie cutter project in the area. The large glass windows at the new Onni Riva Richmond Oval Village condo development will allow for lots of natural light into your home. The Onni Riva Richmond Condo Presentation Centre is located at 7731 Alderbridge Way Richmond BC and they are now open daily between 12-6pm (except Friady). The Richmond RIVA Floor Plans Released!